I had had trouble sleeping the night before, courtesy of the heavy dinner and the alcohol, and as I got up to have a shower at 7 am I promised myself to be more careful next time. My plan that day was to ride to Extremadura and stay at a hostel called Via de la Plata in Hervás which I had seen on a previous trip and looked interesting, but the day before I had called to check whether they had available rooms and discovered to my dismay that they were closed for the time being, apparently because the guy who ran it had not had his contract renewed. That, having received a text from a friend of mine telling me he was spending a few days in Toledo and finally the fact that I had almost an extra 100 km to cover that day since we had not reached Teruel the night before made me decide to forego Hervás and the Valle del Jerte and stop at Toledo. After all, I had already seen that area a few years before, and all I needed was an intermediate stop on my way to Mérida, which was the place I wanted to visit. We rode out in the chilly morning, all layers on our suits, and not long after leaving town came to the crossroads where our roads parted – Gerard was heading to the town of Valdelinares, which is supposed to be the highest in Spain, and I was heading south to Teruel and then West to Toledo. We said our goodbyes and wished each other a good route and less than an hour later I was in Teruel. I did not stop, I have spent countless summer holidays in the area and know the city well, but contrary to what most people seem to think, it is a very nice city and there are lots of interesting places to visit and things to do in the area, so it is well worth spending a holiday there. 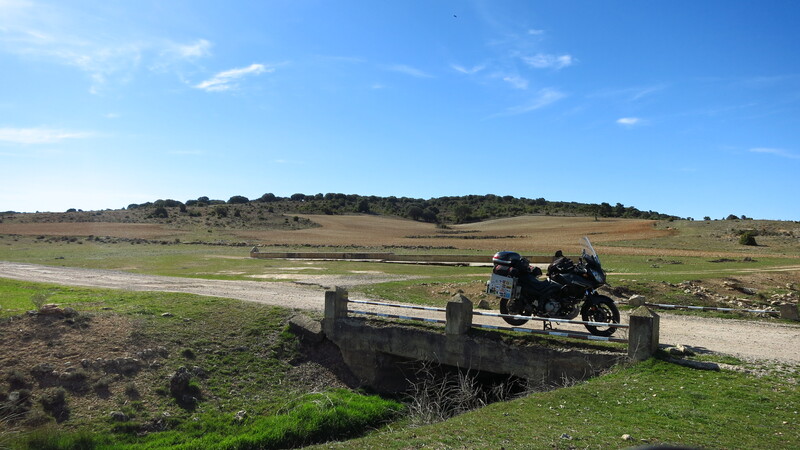 The road from Teruel to Cuenca was almost deserted and offered nice fast sweeping corners and very good tarmac, so I had a quite a good time, and was leaving Cuenca behind and entering the motorway for the second part of the journey quite soon. This motorway is witness to how stupidly money was spent on unnecessary infrastructure when the country still had permission to reach deep into the EU pockets. There is practically nothing between Cuenca and Ocaña, past Tarancón, where the motorway ends, and in the whole journey on it I only saw two other cars. Needless to say, it was unbelievably boring, and had it not been for the fact that I had already told my friend that I would be in Toledo by lunchtime, I would have avoided it and stuck to smaller roads. Toledo is a city with a rich story and heritage, and having met my friend, dropped my bag at the hotel and parked the bike, we went off to find a good place to have lunch and then to wander through its narrow streets all afternoon. The city was bustling with life, lots of tourists having come to see the Easter celebrations, and there were people everywhere. We walked around until the evening, when we sat down at a small bar in an alley that served excellent burgers with great rock-inspired names. We both choose an AC/DC, which seemed quite a balanced one, not too heavy. Funnily enough, the simplest one was called Bon Jovi. Having forgotten what I had promised myself in the morning, I wanted to have a gin and tonic after dinner, but the streets appeared to be quite deserted and most of the bars were already closing. I had forgotten that it was a Sunday and most people worked the following day. We found an open bar were we got a pair of passable drinks before heading for bed. 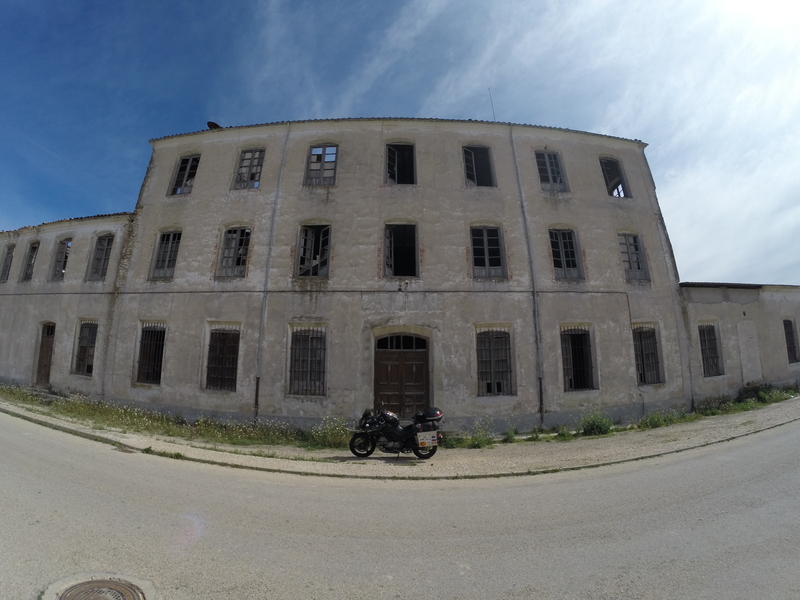 I wanted to leave before sunrise the following day – my intention was to be in Mérida by midday to have time to visit the city and also ride some interesting roads in the morning, I had had enough motorway today. 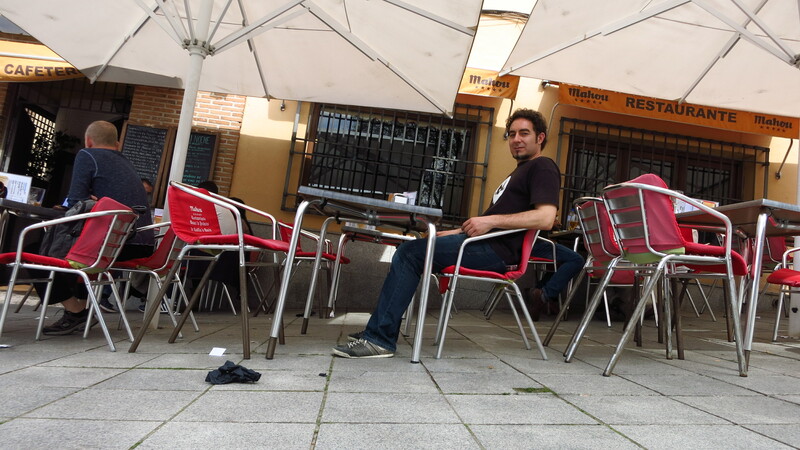 This entry was posted in Portugal and Southern Spain 2015, Travel and tagged Teruel, Toledo by Kilian. Bookmark the permalink.